I have never paid this much for a blanket... it was well worth the price. Very warm cozy for a cold winter night. Lose yourself in the luxurious feel and refreshing charm of this gorgeous microplush blanket from Vellux. 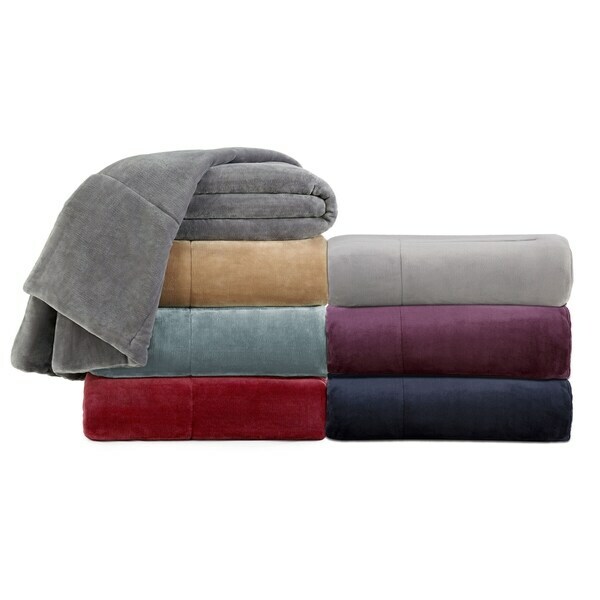 A warm and hefty complement to any bedding ensemble, this impressive blanket is made from premium polyester material and comes in five rich and versatile color options. The resilient machine washable design makes this blanket perfect for children and pets, as well as an ideal candidate for both home and commercial settings. Dimensions 18.0 In. X 15.0 In. X 3.0 In. We recently replaced the original Vellux blankets that had finally begun to fall apart (after 15 yrs of use). Purchased a cotton Vellux blanket and this one. We love both, but this is the favorite blanket in our home- had to purchase five more! Everyone wanted their own, with a spare to use as a throw. Soft, washes well, and used at home and in the car on our trips. To add to other reviews praising this blanket, this is truly a wonderfully thick and plush blanket. I hesitated at how pricey the blanket is but was looking for a blanket to go on my full sized guest bed between the sheets and the coverlet in order to provide some extra warmth in the winter. I ordered the neutral sand color and found it to be true to color. Once I unfolded the blanket, I realized why it was so expensive. It really is an extremely thick, soft and well-made blanket. Like none others I've ever seen on the market, which explains the high price point. And it is exactly what I was looking for, not like those thin velour blankets that are light-years behind in comparison. My kids love this blanket so much that I agreed to fold it on the end of the guest bed until we have company rather than make the bed with it, so that my kids can grab it and drag it into the living room when they want a plush oversized blanket to cuddle in. My 7 year old son loves it so much that I just ordered him his own twin sized one to go on his bed for these winter months under his comforter. I cannot rate this blanket highly enough. Would love to see them expand the colors even further to perhaps add a chocolate brown choice. Very heavy blanket, alnost like a quilt! This is a 'very heavy' blanket, it reminds me of a quilt rather than a blanket. Couldn't tell that from the pictures, but the quality is great and I am very happy with it. Burgundy color is great as well. Have not washed it yet so can't comment on how well it will look after washing. Assume it will be fine. I purchased the queen size Ivory Vellux blanket. Washed/dryed blanket in my front load washer/dryer, barely any lint in the dryer filter. The blanket is extremely soft and thick. I have not used it yet as it's getting warm outside so I don't know how it will hold up to use. So far I am very pleased with the blanket. Soft and warm, durable and the perfect size. Absolutely love this blanket. Ordered in grey. Love the color, washes well. Excellent purchase at a great price. This is a very nice blanket, very soft and comfortable. I ordered the Trooper Blue and the color is much nicer in the photo. When I received it, the color was more a green/grey color. I don't like the color at all but I'm hesitant to send it back since the blanket is so nice and none of the other colors will match my decor. This blanket is sumptuous! It’s my very favorite because it’s pretty to look at and feels very silky. My husband loved it so much because it’s thick and really comfortable. The one issue is that you cannot wash this in a machine because it beads up horribly and those beads rubbed all over my sheets making a mess. I won’t do that again. It’ll go to the cleaners. The Plush Lux Microplush Blanket provides great warmth. It is far superior to standard Vellux blankets for heat retention and comfort. Well worth the higher price! So perfect love the color and very well made. Would be recommended to friebds and family. The softest, snuggliest blanket I have ever had. A deep, rich navy color. It is very lightweight but warm, I had to adjust my thermostat down to 67 in order to sleep with it comfortably. I am incredibly picky and love the old school vellux blankets especially after they have been washed until they are about to wear out. This is better straight out of the bag, warmer by far and softer. 5 stars. Praying it washes well. Will update in a few months with washing results. This plush blanket is all that and more. We absolutely love it !!! The feel and ease of taking care of it is awesome! Easy to wash and it comes out with no wrinkles! Awesome!!! So soft and wonderfully warm. I removed the comforter from my bed and just use this blanket now. It looks terrific and plushy plush. Love to snuggle up in bed. Love this blanket! So soft and warm. Warm and a great size.. easy to wash too! Have had one already and wanted one in ivory. Because I'm looking for a warm winter blanket and it was described as heavyweight. I hope to confirm that when I get it. "What is the weight of the king size?" The approximate shipping weight on this item is 9 lbs. I know you didn't ask this and it's been answered but we love this blanket - it's gorgeous and if you tend to be cold will keep you cozy. Just beautiful! "Is the outer shell of this blanket the same fabric as the original Vellux blanket?" Hello pickyournose, this lovely item is made of premium polyester. We do apologize, we a variety of Vellux blankets and not aware of which item number you wish to compare this with. Thank you for shopping with us. I don't know the answer but it's quite soft - we love it!